PURPOSE: To evaluate the results of photorefractive keratectomy (PRK) for the correction of myopia and myopic astigmatism in megalophthalmos anterior. METHODS: Four eyes of two brothers with megalophthalmos anterior were treated with PRK. In patient 1, best spectacle-corrected visual acuity (BSCVA) was 20/20 in both eyes with a refraction of -4.50 -4.50 x 180? in the right eye and -3.75 -3.00 x 175? in the left eye. In patient 2, BSCVA was 20/25 in both eyes with a refraction of -4.25 x 166? in the right eye and +0.50 -4.00 x 175? in the left eye. RESULTS: Topographic map, slit-lamp, ultrasound biomicroscopy, and postoperative course (no progression), supported with vectorial analysis, demonstrated megalophthalmos anterior. During 24-month follow-up, mild haze was observed and BSCVA was maintained. Megalophthalmos anterior is a distinctive type of corneal dysgenesis. This group of disorders can best be described as a disturbance in the growth and development of neural crest cells. A large myopic astigmatic refractive error often results from the abnormal optical architecture.1 Corneal thickness and endothelial cell density are generally normal. The iris root may exhibit transillumination defects as a result of attenuation of the dilatator muscle. Because of the abnormal spatial relationship of structures in the anterior segment and stretching of zonules, miosis, iridodonesis, phacodonesis, and lens subluxation or dislocation may occur and it may later result in secondary lens-induced glaucoma.2"4 The lens, furthermore, may become prematurely cataractous. Marian's syndrome, Apert's syndrome, and mucolipidosis type II have been found in association with this disorder.5 It is important to emphasize that corneal dysgeneses are nonprogressive abnormalities with no progressive thinning of the cornea and no decrease of endothelial cells. Two brothers aged 26 and 27 years, respectively, presented with myopia and astigmatism. Both patients had megalophthalmos anterior. Their father had good visual acuity and only required presbyopic correction. Their mother needed correction formerly, but the refraction was unknown. No history of ocular or any other disease was found among family members. Preoperative refractive and descriptive data are shown in the Table. 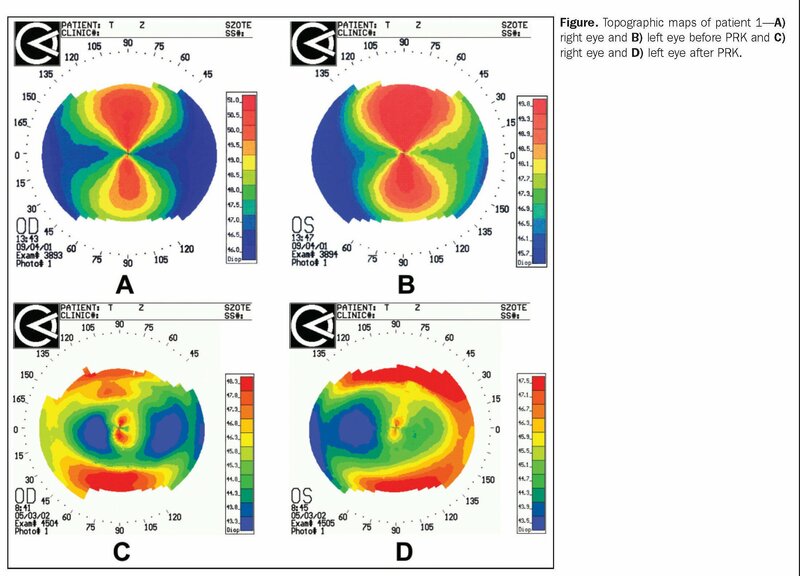 Corneal topography (Topographic Modeling System TMS-I; Computed Anatomy Ine, New York, NY) demonstrated a "bow-tie" appearance in both cases, typical of regular astigmatism (Fig). Examination by slit-lamp microscope revealed clear cornea with normal thickness6 and open iridocorneal angles in both patients. Pseudopolicoria, transillumination defects, full-thickness iris holes in the periphery, iridodonesis, moderate mydriasis, and phacodonesis were present in both patients. Lenses were clear in patient 1, mild peripheral opacities were seen in patient 2. Intraocular pressures (applanation tonometry) were <17 mmHg. Normal fundus was found by direct ophthalmoscopy. Ultrasound biomicroscopy (Ultrasound Biomicroscope System Model 840, 50 MHz; Zeiss Humphrey, San Leandro, Calif) revealed sparsely (probably reduced by 20% to 25%) elongated and more slender ciliary processes.37 There were no associated systemic disorders. Phenotypically, the patients were different: patient 1 had brown hair and brown iris and patient 2 had blond hair and blue iris. No contraindications for photorefractive keratectomy were present after complete ophthalmological examination. Laser in situ keratomileusis was not performed due to accentuated anterior corneal curvature and increased corneal asphericity. Procedures were performed with topical anesthesia (tetracain hydrochloride) and with a 193-nm argonfluoride Schwind Keratom 2 excimer laser (Schwind, Kleinostheim, Germany) (fluency 160 mj/cm2, repetition rate 13 Hz, ablation diameter 7.5X5.7 mm or 8.1X5.7 mm). Postoperative treatment was neomycin drops five times daily during the first 5 days, and fluorometholon drops between weeks 3 and 12, continuously decreasing the dosage. Fellow eyes were operated 3 months later. Examinations were conducted 1, 5, and 21 days and 3, 5, 6, 12, and 24 months postoperatively. The postoperative period was characterized by satisfactory refractive results. Uncorrected visual acuity (UCVA) and best spectacle-corrected visual acuity (BSCVA) improved in all eyes, and these refractive results were maintained in both eyes in patient 2 and in only the left eye in patient 1 during 24-month followup. In patient 1, a large corneal erosion occurred in the right eye from a high-pressure air-blow machine 4 months after PRK. Best spectacle-corrected visual acuity was 20/20 with a refraction of -1.25 -1.00 X 8? 24 months postoperatively. Mild haze was observed in all eyes (maximal grade according to Hanna 1.0) and disappeared at 3 months. Figure. Topographie maps of patient 1 ? A) right eye and B) left eye before PRK and C) right eye and D) left eye after PRK. and S^sub I^ and C^sub I^ are the initial or preoperative spherical and astigmatism vector at α axis (in "plus" cylinder notation), S^sub R^ and C^sub R^ are the resultant or postoperative spherical and astigmatism vector at γ axis (in "plus" cylinder notation), and C^sub SURG^ is the surgically induced astigmatism vector at β axis (in "minus" cylinder notation). Our findings, especially the topographic map (see Fig), slit-lamp and ultrasound biomicroscope features, and the postoperative course (no pathological progression), supported by vectorial analysis, confirmed anterior megalophthalmos. Based on our results, we recommend PRK to treat myopia and astigmatism in megalophthalmos anterior. The clinical response after PRK in simple megalocornea and anterior megalophthalmos is similar to that in normal cases. Postoperative results support our diagnosis (no sign of progression) and our expectations. 1. Waring GO III, Rodrigues MM. Congenital and neonatal corneal abnormalities. In: Duane TD, ed. Duane's Ophthalmology. Philadelphia, Pa: Harper and Row; 1986:934-1243. 2. Vail DT. Adult hereditary anterior megalophthalmos sine glaucoma: a definite disease entity with special reference to extraction of the cataract. Arch Ophthalmol. 1931;6:39-46. 3. Jerndal T. Gonio dysgenesis and hereditary juvenile glaucoma: a clinical study of a Swedish pedigree. Acta Ophthalmol. 1970;107(Suppl):l-34. 4. Malbran E, D odds R. Megaloc ornea and its relation to congenital glaucoma. Am J Ophthalmol. 1960;49:908-921. 5. Pearce WG. Autosomal dominant megalocornea with congenital glaucoma: evidence for germ-line mosaic. Can J Ophthalmol. 1991;26:21-27. 6. Pierro L, Conforto E, Resti AG, Lettanzio R. High-frequency ultrasound biomicroscopy versus ultrasound and optical pachymetry for the measurement of corneal thickness. Ophthalmologica. 1998;212(Suppl l):l-3. 7. Pletz C, Hentsch R. Hereditary anterior megophthalmos ? a genealogical study of 12 patients in 4 generations [German]. KHn Monatsbl Augenheilkd. 2000;217:284-288.